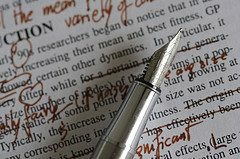 Be Honest: 5 Self-Editing Tips For Increased Objectivity - Writer's Relief, Inc. It can be hard to see our own writing for what it is. We think it’s brilliant or terrible. It’s overdone or underdone. It’s exactly right and not what we’re going for at all. There are a lot of emotions wrapped up in how we writers look at our own work. And those emotions can get in the way of getting a clear, focused picture of our strengths and weaknesses. If you want a clearer, more honest way of approaching your own writing and self-editing process, start here. 1. Listen to your instincts. Brain science teaches us that humans are selective about what we give our attention to in any given moment. We suspect it’s the same with critique and the writer’s brain. Let’s say a little voice is telling you your book’s ending isn’t quite right. But you second guess: Maybe I’m wrong. Maybe it’s okay. The easy way out is to ignore your instincts and go with the voice that’s saying it’s good enough as is. The hard way out is to delete the last third of your book and rewrite it. Listening to your instincts can yield bigger, more surprising results than playing it safe. 2. Write down your own critique. If you think to yourself, My main character is weak on character development while you’re reading, then you’ve taken a good first step. But it’s easy to conveniently “forget” this issue or sweep it aside. To get over this “if I can’t see it, it’s not happening” issue, write down your own strengths and weaknesses. In print, the steps you need to take become concrete, clear, and un-ignorable. If your reader hints at or alludes to the same elements that you’re questioning, then it may be time to revise. But keep in mind that all readers bring their own perspectives to their critique, and ultimately you might not agree. 4. Don’t be afraid to delete passionately. Don’t think of deleting as “taking away” or “breaking down.” Think of it as an act of bravery that “makes room” and “sets a foundation for expansion.” If you’re not 100% sure a scene or a line is working, get rid of it completely. Don’t even look at it again (of course, you may want to save it somewhere for future reference). By starting with a truly blank slate, you’re either going to discover something totally new and wonderful, or you’ll find out that you had it right the first time. 5. Step away for a while. You’ve heard before how helpful it can be to put some distance (time) between you and your work-in-progress. Taking a break isn’t lazy. In fact it can be very hard to make yourself step away from your work for a while. Sometimes, the best thing you can do for your project is to not do anything at all. And when you return to your project, you can tackle it with fresh eyes. Maybe you’ve heard James A. Michener’s quote: “I’m not a very good writer, but I’m an excellent rewriter.” A lot of the hard work of writing happens during the editing process. So go forward bravely and without fear of seeing something you might not like. There’s power in self-editing: It will allow you to move upward and onward in your writing and your life. QUESTION: Be brutally honest: Tell us what you do to keep your self-editing skills sharp. ← New Adult Fiction: The Next Big Thing In Publishing? I have had a script on my disk since 1996, in-and-out while writing those novels providing me bread and butter. But this script, now called “Sling man”, is something different. It is the script i really want to be remembered for. But sadly, it is very hard for me to DELETE ANYTHING. So I never delete anything. Nah, I cut it out, and paste it onto a page for later use. I have lots of those pages. Hundreds. They have one ting in common. I never touch them again. I print out the whole thing and divide the manuscript into rough scenes. Then I get my highlighters out and go to town on it. Purple for stuff that’s irrelevant to the plot, pink for stuff I hate, blue for stuff that needs expanding and green for grammar errors and typo’s. At the end of each scene I write down what my thoughts are more generally. It’s a great way to rip through the editing. I only truly learn about my characters after I finish the first draft. During my first edit, I become my characters and act out various scenes. I fight with my characters and I love my characters, all in the act of editing and re-writing my work. I step away, then return the next day, and take another. My work is always better after this exercise, and I save the older copies, just in case. I also set up electronic book marks in my work, with a date and time, so I know where to return. This makes things easier on those nights when a plot change wakes you at 2 AM. I allow as many knowledgeable people as possible read my first draft and critique. I utilize their critiques as often as i can. I will reread my manuscript from beginning til’ end at least once a week and edit. I’m editing the first draft of my novel and as you can imagine there is many things wrong with it, but I the best way I’m discovering to self edit is by having another page open and typing into that. As I’m reading over it I’ll stop and open that blank page to write notes on the section. Ranging from quoting parts and telling myself clearly what is wrong, or simply writing “it needs work” reminding myself to go back over it later.